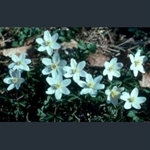 Tight groups of white to dark red flowers through summer and autumn. Persicaria affinis 'Superba' is an excellent ground-cover plant, with spikes of flowers that change from white to pink to quite a dark red, so that all colours are present on different stems at the same time - a display that lasts for many weeks. Woodland perennial with cyclamen-like flowers in magenta, pink or white. Brilliant blue trumpet-shaped flowers in autumn over a low mat of leaves. 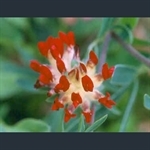 Variety of kidney vetch with bright red flowers. Outstanding silver saxifrage, with huge red-stemmed sprays of white flowers.